This information has been prepared in accordance with regulation issued by the National Highway Traffic Safety Administration of the U.S. Department of Transportation. It provides the purchasers and/or prospective purchasers of Toyota vehicles with information on truck-camper loading. Your Toyota dealer will help answer any questions you may have as you read this information. The figures given in the illustration indicate the recommended center of gravity zone. *:Truck-campers cannot be used with the X-Runner since it is not designed for them. If a load is too far back, it can cause dangerous handling. If it is too far forward, the front axle may be overloaded. When the truck is used to carry a slide-in camper, the total cargo load of the truck consists of the manufacturer’s camper weight figure, the weight of installed additional camper equipment not included in the manufacturer’s camper weight figure, the weight of camper cargo, and the weight of passengers in the camper. The total cargo load should not exceed the truck’s cargo weight rating and the camper’s center of gravity should fall within the truck’s recommended center of gravity zone when installed. Be careful — overloading can cause dangerous braking and handling problems, and can damage your vehicle and its tires. Secure loose items to prevent weight shifts that could affect the balance of your vehicle. When the truck camper is loaded, drive to a scale and weigh on the front and on the rear wheels separately to determine axle loads. Individual axle loads should not exceed either of the Gross Axle Weight Ratings (GAWR). 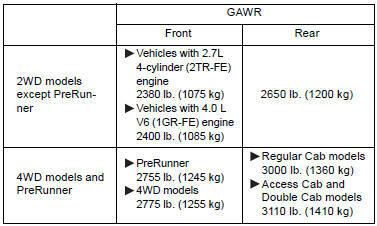 The total of the axle loads should not exceed the Gross Vehicle Weight Rating (GVWR). These ratings are given on the vehicle certification label which is located on the door latch post on the left side of the vehicle. (→P. 531) If weight ratings are exceeded, move or remove items to bring all weights below the ratings.